Fish Fry Every Friday in Lent! 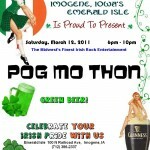 Pog Mo Thon – Live Saturday March 12th! We are very happy to welcome back ‘Pog Mo Thon’, The Midwest’s Finest Irish Rock Band! 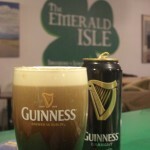 Last year we had them here for our first St. Patrick’s Celebration and they put on a great show for us! Please join us Saturday night from 6 to 10 PM for their second annual trip to Imogene!